As a Graphic Designer I’m always looking for interesting exhibitions on my travels. In Venice I found a very special one: PROPORTIO. 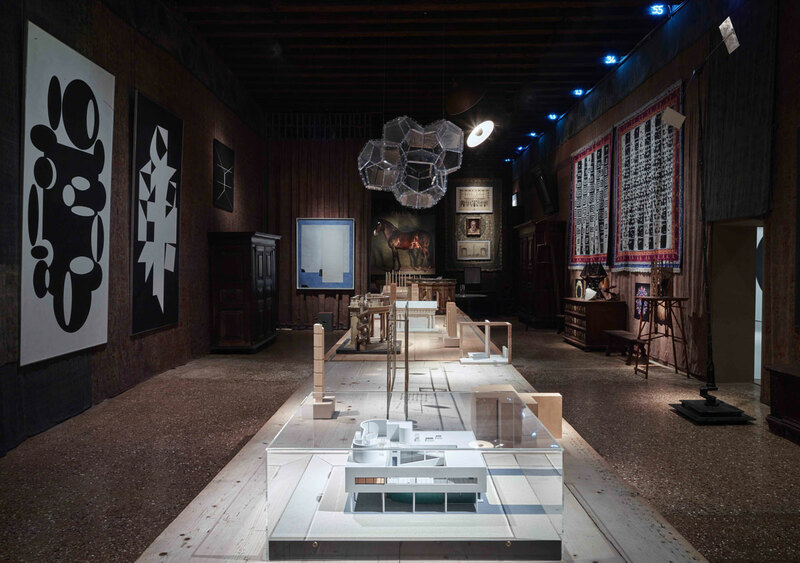 The exhibition was located in an old impressive Palazzo close to the Canal Grande in Campo San Beneto – The Palazzo Fortuny. 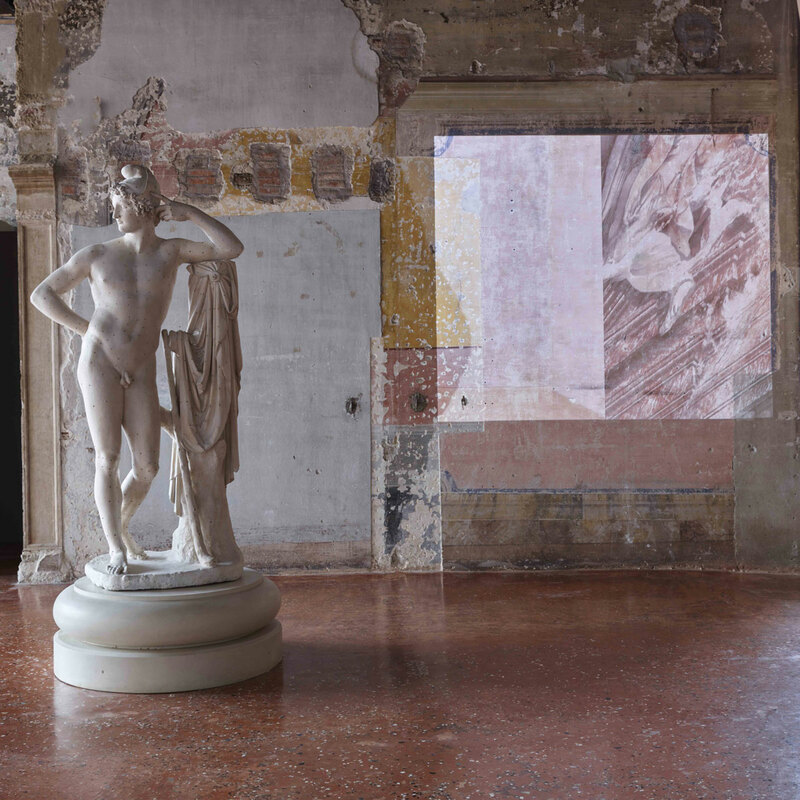 The special thing about the Palazzo as a stage of art is that the rooms and structures of and within the building are still as they were created by Mariano Fortuny, the former owner of the Palazzo. Mister Fortuny was an extraordinary man himself, but describing his life and work would go beyond the scope of this post, so just check this website to find out more about him. When I was entering the exhibition, to be honest, I had no clue about the former owner of the house. Nevertheless his aura was omnipresent. By stepping into the rooms it was like entering another century, entering the world of Mariano Fortuny. But I just became aware of this fact in retrospect. The exhibition PROPORTIO was perfectly integrated into this atmosphere. 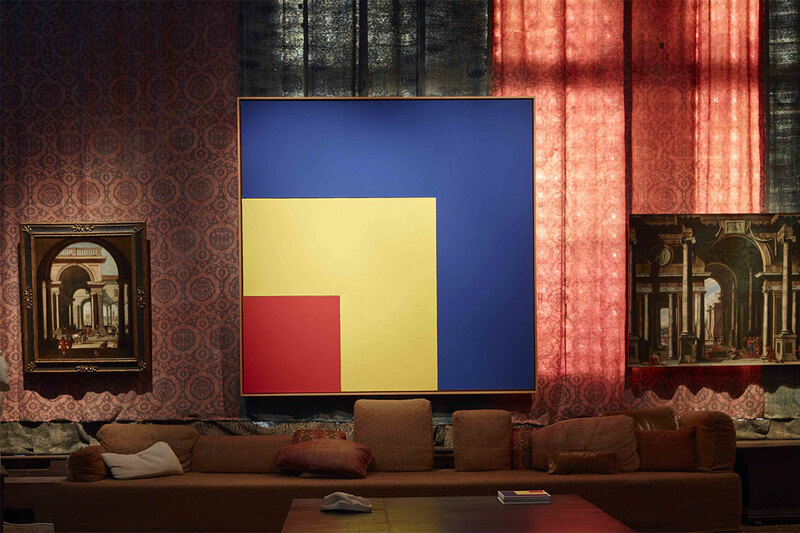 Curated by Axel Vervoordt and Daniela Ferretti it explores the omnipresence of universal proportions in art, science, music and architecture. 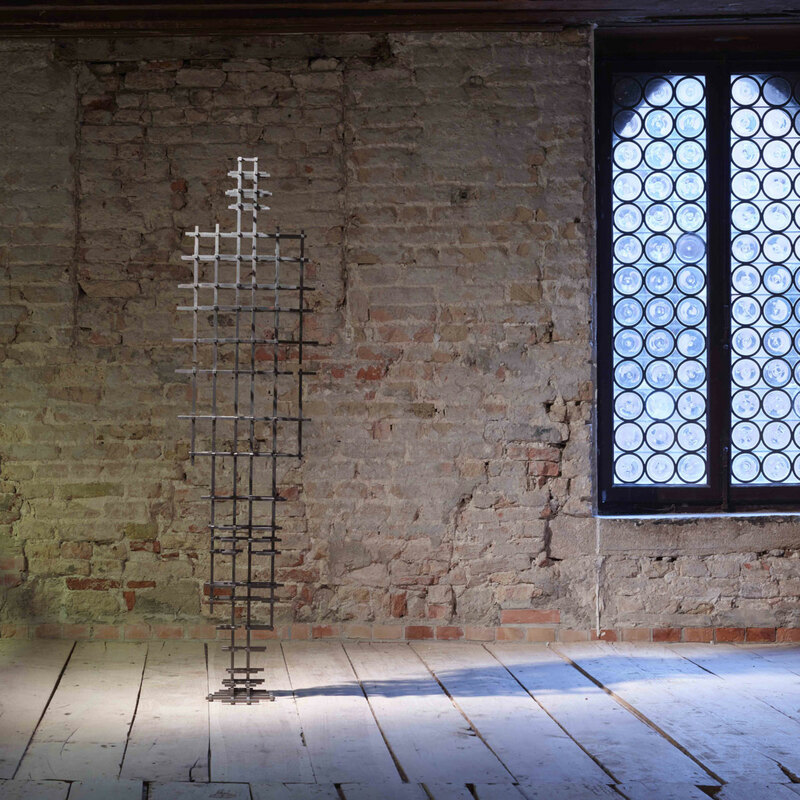 Juxtaposing artworks from different disciplines like old and contemporary art, next to video installations and sculptures and concording with the individual style of Fortuny’s home – well, that really impressed me. Unfortunately the exhibition is already over but let me try to take you on a little tour through it. The first room was like a huge crossword puzzle or cave painting but in a very graphical, modern realization. Not just the walls were painted or taped with signs but also windows, mirrors and the floor. Everything just in black and white. The sensory overload was mellowed a bit by the fact that all written letters and symbols where not in Latin but in a language that I didn’t know (if it was a real language at all). So I couldn’t understand what was written around me and was thereby able to see the whole installation just as an abstract artwork. 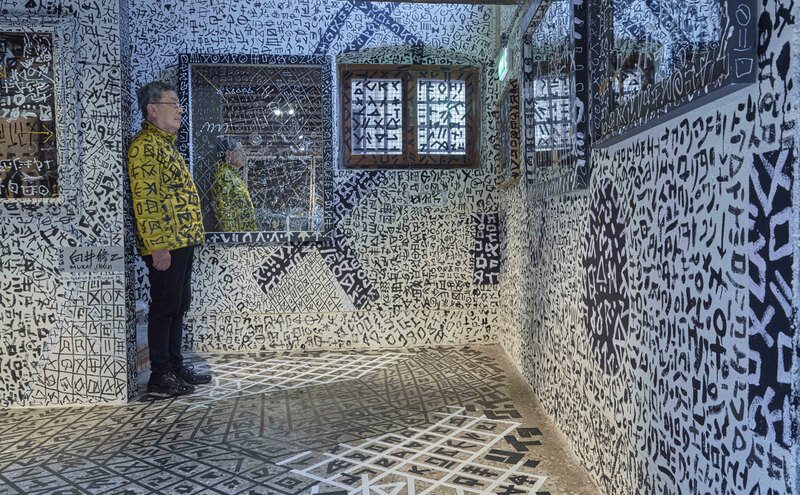 Through the mirrors on the wall the whole place became even more confusing and the visitor became part of the artwork – the reflection seemed to merge with the surrounding, the signs and symbols seemed to be not just around oneself but also on one’s body. 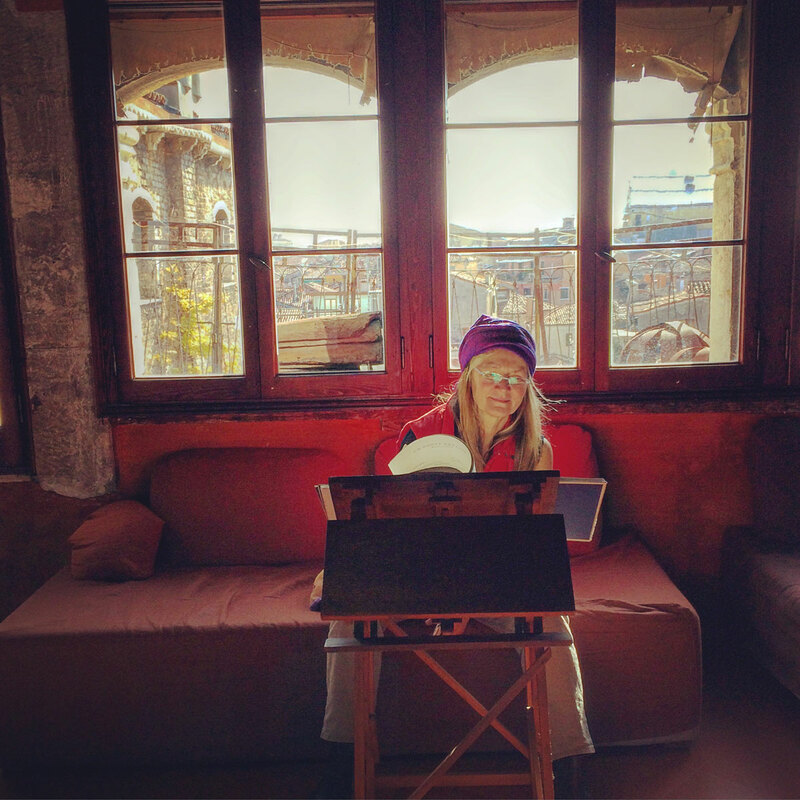 The Mezzanine was the complete opposite of the room before – you were entering an almost empty room of the old Palazzo with its original old wooden floorboards and stone walls and there were just a few objects in the room – slighty enlightened. It was like a neutralisation for my eyes (maybe also the aim of the curator?) to be prepared for the following part. On the first floor I was entering a huge room that reminded me of a living room from another century. The windows were covered with heavy curtains allowing just a few rays of light to pass through. In the middle was a long table showing architectural models of different buildings as well as other small geometric objects. Looking to the right I could see a huge horse in the distance – a paining located above a big and cozy looking couch. The walls were covered with paintings from different art movements. It was the combination of all these art pieces with the old furnitures and tapestries of Mariano Fortuny as well as the accentuated lightning mood that created a very special atmosphere. The second floor was the exact opposite of the floor that I had just left. Daylight covering the whole scenery in a soft white. No wallpapers oder tapestries on the walls just the sheer stone. Partly revealing pastel shades of past times. All shown artworks seemed to fit perfectly into this light undertone of the room. The ceiling at the top floor was not as high as at the other floors and the windows were smaller. That gave the room a comfortable atmosphere just like in a room for meditation. Corresponding to this atmosphere the exhibition was focusing on proportions in the cosmos and intergalaxies, meditation and silence. At the entrance I was invited to take one of the available headphones and walk around listening to Marina Abramovic sound installation ‘Ten thousand stars’, a sonic journey into the universe, facing the infinity of the night sky. According to the exhibitor the installation is also an open invitation to think about the unanswered questions of whether there is a higher purpose behind the order of things and proportions that regulate the universe, and how human beings locate themselves within this order. Anna, meine Güte ist das toll! Ich bin begeistert, wie muss es erst sein es zu erleben?! Danke für’s Beschreiben und Zeigen! !